The Thomas More College of Liberal Arts of Merrimack, New Hampshire, has announced that it has established a series of medieval-style Catholic guilds that will enable its students to gain skills and experience from master craftsmen in areas such as woodworking, sacred art, music, and baking. Thomas More College’s guilds will take its spirit from the associations of men and women who advanced their trades and responded to the needs of their local communities in the Medieval Age, the college says in a statement. Thomas More College’s guilds will operate with the same level of community and charity, the college says. Thomas More College also expects that its guilds will enhance religious life on campus. This fall, for example, students in the woodworking guild will build a new altar for the College’s chapel, while students in the sacred art guild will produce religious art that will hang on the chapel walls. Students in the music guild will be trained to chant and produce sacred music for the Holy Sacrifice of the Mass. The newly established Catholic guilds at Thomas More College are also designed to play a key role in the development of its students. “Thomas More College is preparing its students for a life of self-sufficiency,” said Mr. Schwerdt. Each guild will meet weekly and will be taught by a master craftsman who has spent his life perfecting the skills of his trade. The guilds will include woodworking, sacred art and music. British Archbishops Bernard Longley and Vincent Nichols recently noted the pioneering role in relation to the lay apostolate played by 16th century St Philip Neri, founder of the Oratory, and the soon to be Blessed John Newman, who re-established the Oratory in the UK in the 19th century. St Philip Neri, 1515-1595, the man from Florence, known as the 'Apostle of Rome' became a priest in 1551 and formed the Oratory. Fr Philip gathered together a group of laymen who held services consisting of spiritual readings and hymns and performed charitable works including visiting the sick and poor in Rome, Independent Catholic News notes. After his ordination as a Catholic priest Fr Newman joined the Oratory of St Philip Neri and on 1 February 1848 he established the English Congregation of the Oratory at Old Oscott, renamed Maryvale, on the outskirts of Birmingham. Dr Newman and his community moved into the new Oratory House in Edgbaston during February 1852. Cardinal Newman was to die in his room there on Monday 11 August 1890. The Venerable John Henry Cardinal Newman will be beatified by Pope Benedict during Mass at Coventry Airport, in the Archdiocese of Birmingham, on the morning of Sunday 19 September 2010. From then on he will be known as Blessed John Henry Newman. Archbishop Longley said in his homily on the Patronal Feast of The Oratory: "During this Year for Priests it is encouraging to remember St Philip as a wise, joyful and prayerful priest. Many have followed his inspiring example. The Venerable John Henry Newman was so strongly influenced by what he saw in St Philip's way of life that it became the pattern of his own life and priestly ministry for many years here in Birmingham. "St Philip Neri, too. drew companions to share this life of common prayer, joyful priestly service and the daily search for God's wisdom in the midst of human affairs. As we prepare for Cardinal Newman's Beatification these are still important signposts for the Church's life in this city and for the particular role of the Oratory." Earlier in his homily Archbishop Bernard Longley had stated: "There are certain characteristics of St Philip Neri, the Founder and Patron of The Oratory, that brighten this festival and that benefit us as we try to imitate his faith. "It bore fruit in the way of life he established and is witnessed to by the readiness of his first companions to share that way of life. This happiness of St Philip has continued to inspire those who have joined him and followed his way of life as Oratorians, because it is above all a fruit of the Holy Spirit. He was a joyful priest. Archbishop Vincent Nichols in his homily at the London Oratory said: "St Philip Neri is known as a saint of great joy. Yet this was not a superficial joy. Such joy flows from our being close to Christ, 'remaining in him', as we heard in the Gospel. The 'sap' of the vine is the life of the Holy Spirit within us, moving and shaping our response to all things. As we said in the prayer of the Mass, St Philip's heart 'was filled and inflamed by the fire of the Holy Spirit' and we ask that our hearts will be, too. The Archbishop of Westminster continued: "St Philip's vocation began with his work in the lay apostolate, caring for the pilgrims in Rome. This service, or 'diaconia', is always a key characteristic of the Church, and indeed, of the life of every priest and bishop. "There are some other indicators from the life of St Philip: he always declined ecclesiastical honours; he insisted on a life of chastity, based on humility and lived with joy; we are told that he deliberately cultivated some eccentricities 'in order not to fall victim of the admiration of the people'; he bore criticism and censure patiently." The French philosopher and theologian, Fr Alphonse Gratry, whose writings inspired the pioneering Sillon movement and YCW founder, Joseph Cardijn, was also an Oratorian and contemporary of Newman. Gratry in fact re-established the Oratory in France more or less simultaneously with Newman's efforts in Britain. Rosemary Goldie, the first woman to hold an official post of authority in the Roman Curia has died in Sydney, Australia aged 94. Rosemary, an Australian who took on a special place in Church history with her appointment in 1966 as Under-Secretary of the Council for the Laity, died at the Little Sisters of the Poor, in Randwick in Sydney’s east, on Saturday, aged 94, an Australian Catholic Bishops Conference statement said. Australian Catholic Bishops Conference President, Archbishop Phillip Wilson said Rosemary had made a tremendous contribution to the life of the church. “At a time when lay people and particularly lay women might have struggled to find a voice in Church affairs, Rosemary Goldie was making history by being the first woman appointed as a Vatican curial official,” he said. “Her commitment to the lay apostolate was a life-long passion and her achievements helped pave the way for current generations. Once described as “the Roman Curia’s human microchip memory on the development of the lay apostolate”, Rosemary was also one of the few women appointed as an auditor to the Second Vatican Council, the bishops’ statement said. One of four children of Sydney journalists, Goldie was raised by her maternal grandmother and graduated from Sydney University in 1936. For the next two years she continued her studies at the Sorbonne in Paris. Goldie was invited to join the Permanent Committee for International Congresses of the Lay Apostolate (COPECIAL) set up in Rome by Pius XII in 1952. In 1959 she became Executive Secretary of the Committee. During this period, she worked closely with lay leaders and priests from many movements, including then-Monsignor Joseph Cardijn. This body was the nucleus of the Council for the Laity, created by Pope Paul VI as a result of Vatican II. Rosemary Goldie was also a founder in Australia of the Catholic students movement now known as the International Catholic Movement of Students. Goldie also worked for the International Catholic Movement for Intellectual and Cultural Affairs, known as Pax Romana, at the mo. She was also a member of the Grail. Rosemary Goldie was born in Australia in 1916. At the age of 20, after graduation in her homeland, she came to Paris to study at the Sorbonne University. She took part in the activities of the women-student chaplaincy, which was affiliated to Pax Romana, Fr Antoine Sondag, former ICMICA chaplain writes. In 1937, the Pax Romana International Congress was held in Paris and she attended it. The theme was: the formation of the student. In 1938, the international Congress was held in Vaduz (Lichtenstein, a little Duchy between Switzerland and Austria), and Rosemary Goldie was so much part of the Pax Romana family that she participated in that event as delegate of France since no other women-student was available ! During the Second World War (1939-1945) the Australian student movement affiliated to Pax Romana through the international office, which was at that time located in Washington DC. And as Rosemary Goldie came back to Europe after war, she participated in the “founding meetings” 1946-1947 which saw, under the umbrella title Pax Romana, the creation of the student movement (IMCS) and the professional-intellectual movement (ICMICA). In the new ICMICA secretariat located in Fribourg (Switzerland), an English-speaking staff member was badly needed. So Rosemary accepted this task under the guidance of the newly elected general secretary Ramon Sugranyes de Franch. She spent six years there. As Pax Romana cooperated fully with the Holy See to prepare the first Congress of the Lay Apostolate, organized on the initiative of Vittorino Veronese, president or Italian Catholic Action and Vice-president of ICMICA, Rosemary Goldie became involved in the COPECIAL: the secretariat, in Rome, which had the duty to prepare the three Congresses for the Lay Apostolate in 1951, 57 and 67, and which would give birth to the Pontifical Council for the Laity. "She never gave up her collaboration with Pax Romana after 1951, when she moved to Rome, but did it in a renewed way," Fr Sondag writes. "She is and remains a symbol of Pax Romana, of Pax Romana’s contribution to the evangelization and of the contribution of Vatican Council to the Church: the role of laity, of women in Church and society, of intellectuals (graduates), the evangelization of culture, the presence of non Europeans in the governing body of the Church: today, we would say, the diversity and plurality of cultures within the Church." The Marist Brothers' Iberica province celebrated its third provincial chapter December 27-29, 2009 in Lardero (La Rioja). There were 37 brothers capitulants present, along with councilor general Br. Antonio Ramalho, delegate of Brother Superior General, and six invited lay people. At the beginning of the sessions the Chapter installed the new provincial, Brother Ambrosio Alonso. The methodology used in the proceedings was that of “see, judge, act”. The first day consisted in a perception exercise and listening to the various feelings and voices from around the Province, in a retrospective of the past three years, using the results of the surveys conducted by the preparatory commission, as well as five reports developed by certain commissions or teams: province priorities, the expanded council, the Mission Commission, the educational works commission and the commission on spirituality. At another point other reports were considered: that of the Technical Team of Brothers, vocation ministry, publications service and the commission on finances. Pope Benedict XVI spoke about the precious gift of Creation, emphasizing that humanity's treatment of the environment impacts “integral human development" at the general audience on August 25, 2009. In his newly released encyclical 'Caritas et Veritate' Pope Benedict calls for a renewal of the global financial order based on "an ethics which is people centred" with the goal of common good, in his newly released encyclical. The underscores the "need for a system with three subjects: the market, the State and civil society," to "civilising of the economy", the Vatican Information Service said, quoting from the text. The encyclical is Benedict's third. Filled with terms like "globalisation," "market economy," "outsourcing," "labour unions" and "alternative energy," the New York Times reported, "it is not surprising that the Italian media reported that the Vatican was having difficulty translating the 144 page document into Latin." "The economy needs ethics in order to function correctly; not any ethics, but an ethics which is people centered," the Pope says. Continuing on the motivation for the encyclical, Cardinal Martino said that "these great novelties ... would be enough by themselves to motivate the writing of a new social Encyclical", said the cardinal, "yet there is another reason: ... 'Caritas in veritate' was conceived by the Holy Father as a commemoration of the fortieth anniversary of Paul VI's 'Populorum Progressio'" although the theme of this new Encyclical "is not the 'development of peoples', but 'integral human development'. ... We could say, then, that the perspective of 'Populorum Progressio' has been broadened". Cardijn Community International welcomes the timely encyclical which furthers the motivation for 'Populorum Progressio' and hopes that the progressive forces within the Church and lay people's organisations will draw strength and inspiration from the encyclical to continue their role as 'agents of change' to build a 'just and green world'. BANGKOK (UCAN) -- Caritas Asia has stressed its commitment to "a paradigm shift," from providing only disaster relief to engaging communities in long-term human development. When dealing with disasters in the past, intervention was "short-term" and "status-quo oriented," said Indian Bishop Yvon Ambroise of Tuticorin, president of Caritas Asia. "Now we are going for change-oriented" action, he said on the sidelines of the Caritas Asia Forum and Conference held June 9-10 in Bangkok. He also stressed this point to the forum's 60 participants, who included leaders of all Caritas national agencies in Asia and representatives of Western partner organizations. Caritas Asia is a regional body of Caritas Internationalis, a worldwide confederation of Catholic relief, development and social service organizations in 162 countries. Elaborating on the paradigm shift, Bishop Ambroise said that though Caritas will continue to give relief aid in the aftermath of a disaster, after a few weeks of doing so it will shift to empowering the affected communities to start livelihood programs. In these programs, people must make their own decisions and lobby their own government to help them, he added. "We have to prepare the communities to help themselves," he stressed. This paradigm shift that started several years ago, he continued, is a result of the collective experience of Caritas Asia, which became a formal body in 1999. However, Bishop Ambroise clarified that in some countries, Caritas will continue to give relief aid. He said that in central Asian countries, for example, Caritas runs soup kitchens because it just started operations there. Lida Jacob, a guest speaker at the forum, also spoke on this new paradigm for human development. The former adviser to the Kerala state government in India on gender and women empowerment urged Caritas organizations to work in partnership with government, non-government and civil society organizations in pro-poor projects. She said all efforts should result in corruption-free scheme, investments on employment-intensive projects such as housing for the poor, and strong domestic markets. She also called for the lobbying of governments for free or subsidized food, health care and education; for liberal credit conditions for small industries; and for crop insurance to limit the effects of price fluctuations. She also cited what is already being done in her own area in Kerala, where a massive network of self-help groups involving the poor, especially women, has generated projects such as day-care centers, housing schemes for the poor, training to upgrade skills and micro-financing by banks. She also stressed the importance of local self-governing bodies getting involved in these activities. Nicanor Perlas, a Filipino global consultant on integral sustainable development, gave an overview of the widespread poverty the world faces and the potential consequences of climate change, issues that directly impact Caritas' work. In India, for example, 79 percent of the population survive on US$2 or less daily, he noted. Tony Wee, executive secretary of the Archdiocesan Office for Human Development in Kuala Lumpur, or Caritas Malaysia, told UCA News that his organization works with all parishes in people empowerment projects. It also runs the country's biggest AIDS hospice outside the capital in collaboration with a government hospital, as well as a "feeding center" that provides food for poor people five times a week near the Kuala Lumpur cathedral. Most of the beneficiaries of these two projects are Muslims. Yormahmad Kholov, deputy director of Caritas Tajikistan, said Caritas is only a small NGO in his country that has just 300 Catholics. It has a center for elderly people and a medical center for children. "Now, we are looking into disaster preparedness," he said, due to landslide problems in the country. CCI congratulates Bishop Yvon Ambroise for his bold initiative. Bishop Ambroise was a dynamic Chaplain of the YCW in India. He was instrumental in starting YCS and YCW in Puducherry, India. "Work in the Lord's Large Vineyard Needs 'Christifideles Laici'"
Here is Pope Benedict's 15 November 2008 address to the 23rd plenary assembly of the Pontifical Council for the Laity. I am pleased to meet all of you today, Members and Consultors of the Pontifical Council for the Laity, as you meet in Plenary Assembly. I greet Cardinal Stanisław Ryłko and Bishop Josef Clemens, President and Secretary of the Dicastery, and together with them the other Bishops present. I extend a special welcome to the lay faithful coming from diverse apostolic experiences and various social and cultural contexts. The theme chosen for your Assembly "20 Years From 'Christifideles Laici': Remembrance, Development, New Challenges and Work" directly introduces us to the service that your dicastery is called to offer to the Church for the good of the lay faithful of the entire world. The apostolic exhortation "Christifideles Laici" defined the magna charta for Catholic laity of our time is the mature fruit of the reflections and of the exchange of experiences and proposals and of the reflections of the 7th Ordinary General Assembly of the Synod of Bishops, which took place in the month of October in 1987 on the theme "Vocation and Mission of the Laity in the Church and in the World". It involved an organic revisiting of the Second Vatican Council's teachings in regard to lay people: the dignity of the baptized, the vocation to holiness, belonging to the ecclesial communion, participation in the building of the Christian community and the Church's mission, witness in all social contexts and commitment to service of the person for the individual's integral development and for the common good of society themes present above all in the Constitutions "Lumen Gentium" and "Gaudium et Spes," as well as in the decree "Apostolicam Actuositatem." While taking up again the teachings of the Council, "Christifideles Laici" orients the discernment, examination and orientation of lay efforts within the Church faced with the social changes of these years. In many different Churches lay participation has grown thanks to pastoral, diocesan and parish councils revealing itself to be very positive insofar as it is animated by an authentic sensus Ecclesiae. The clear awareness of the Church's charismatic dimension has brought about an appreciation and esteemed the more simple charisms that Divine Providence bestows on individuals as well as those that bring great spiritual, educational and missionary fecundity. Not by chance does the Document recognize and encourage the "new era of group endeavors of the lay faithful". It is a sign of the "richness and the versatility of resources that the Holy Spirit nourishes in the ecclesial community" (n. 29), which indicate the ecclesial "criteria" necessary on one side for the discernment of Pastors and on the other side for growth of the life of lay associations, ecclesial movements and new communities. In this respect I would like to thank the Pontifical Council for the Laity in a very special way, for the work completed during the last decades to welcome, accompany, discern, recognize and encourage these ecclesial realities, favoring the knowledge of their Catholic identity, helping them to insert themselves more fully into the great tradition and the living fabric of the Church, and promoting their missionary development. To speak of Catholic laity means to refer to the countless baptized persons working in multiple and various circumstances to grow as disciples and witnesses of the Lord and to rediscover and experience the beauty in the truth and joy of being Christians. The current cultural and social condition renders still more urgent this apostolic action to generously share in the treasure of grace and holiness, of charity, doctrine, culture and works, from which the stream of Catholic tradition flows. The new generations are not only the preferred audience of this transmission and sharing but also those whose hearts await truth and happiness in order to be able to give Christian witness, as happens already in an admirable way. I myself have been witness to it in Sydney at the recent World Youth Day. And therefore I encourage the Pontifical Council for the Laity to continue the work of this providential global youth pilgrimage in the name of Christ, and to work at the promotion of youth ministry and their authentic education everywhere. I also know of your commitment regarding issues of special importance, such as that of the dignity and participation of women in the life of the Church and of society. I have already had the opportunity to appreciate the Convention you sponsored 20 years from the promulgation of the apostolic letter "Mulieris Dignitatem" on the theme "Woman and Man, the Humanum in its Entirety". Man and woman, equal in dignity, are called to enrich themselves mutually in communion and collaboration, not only in matrimony and in the family, but also in society and all of its dimensions. Christian women are asked to be knowledgeable of and courageous in facing their demanding work, for which, however, they do not lack the support of a distinct tendency towards holiness, of a special acuteness in the discernment of our time's cultural currents, and of the particular passion for human care that characterizes them. Enough cannot be said for how much the Church recognizes, appreciates and values women's participation in her mission of service to the spreading of the Gospel. Allow me, dear friends, a last reflection regarding the secular nature that is characteristic of the lay faithful. The world within the scheme of family life, its working and social life is a theological place, an environment and a means in which and through which to realize their vocation and mission (cf. "Christifideles Laici," 15-17). Every milieu, circumstance and activity in which we engage that can become resplendent with the unity of faith and life is entrusted to the responsibility of lay faithful, moved by the desire to communicate the gift of encounter with Christ and the certainty of the human person's dignity. It is their duty to take up the witness of charity especially with the most poor, suffering and needy just as it is to assume every Christian task aimed to construct conditions of ever greater justice and peace within human coexistence, thus opening new horizons to the Gospel! Therefore I ask the Pontifical Council for the Laity to follow with diligent pastoral care the formation, witness and collaboration of lay faithful in the most varied situations, in which the authentic nature of human life in society is at risk. In a particular way, I confirm the necessity and urgency of the evangelical formation and pastoral accompaniment of a new generation of Catholics working in politics, that they be coherent with the professed faith, that they have moral firmness, the capacity of educated judgment, professional competence and passion for service to the common good. Work in the Lord's large vineyard needs "Christifideles Laici" who, like the Most Holy Virgin Mary, speak and live the "fiat" to God's plan in their life. With this prospective, I thank you, then, for your precious contribution to such a noble cause and I wholeheartedly impart the Apostolic Blessing to you and those dear to you. Pope Benedict continued his reflections on St. Paul people to consider Paul's teaching on faith and works in the process of justification, CNA reports. Emphasizing that works do not justify a person, the Pope said that works necessarily flow from love for Christ. In his catechesis on St Paul’s teaching on justification, the Pontiff stated that man is unable to justify himself by his works, but becomes just before God only because God restores us to right relationship by uniting us with Christ. He continued, "Man obtains this union with Christ by means of faith." This faith, if it is true and real, becomes love and expresses itself in charity; without charity faith would be dead. Pope Benedict then noted that there has been confusion concerning the relevance of man's actions for salvation. According to the Pope, the interpretive key can be found in St Paul's Letter to the Galatians, which emphasizes the gratuitousness of justification apart from man's works and highlights the relationship between faith and charity and faith and works. The fruit of the Holy Spirit "is love, joy, peace, patience, kindness, generosity, faithfulness, gentleness, self-control," the Holy Father quoted, pointing out that at the beginning of Paul's list of virtues is love and at the conclusion self-control. "The centrality of justification without works, the main object of Paul's preaching, presents no contradiction to faith working through love; on the contrary it requires that our own faith be expressed in a life in accordance with the Spirit," Benedict XVI added. Although some people see a conflict between what Saint Paul teaches and what Saint James teaches, the Pope explained that "For both Paul and James, faith working through love bears witness to the free gift of justification in Christ." 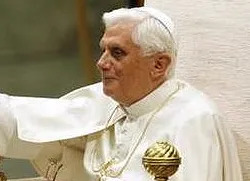 The essential point is that Christian ethics do not arise from a system of commandments," Benedict XVI indicated, "they are a consequence of our friendship with Christ. The Pope concluded, "Nothing and no one can ever separate us from God's love. This certainty gives us the strength to live the faith that works in love." The Forum of International Catholic NGOs is the successor organisation to the former International Catholic Organisations Conference. Forum Working Group chair, Johan Ketelers, offers some background on the Forum's perspectives. We live in a rapidly changing world marked by intense societal challenges affecting traditional moral values and the very social fabric of our societies. The responsibility of the Church in the many societal debates has in even more ways than ever before become of growing importance; and questions are raised how to counter some of the consequences of the present times, how catholic inspired organizations can best contribute to nurture the many political debates with a catholic inspired perspective and how the impact of this voice can be increased as to make a difference. Early last year a working group of volunteers started preparing a process to examine these questions on what was to become a major gathering of some 90 international Catholic inspired Organisations with International statutes. The resulting Forum, which was held in December 2007 united during three days of exchanges the representatives of the Secretariat of State, representatives of various Pontifical Councils, the representatives of the Holy See at the various intergovernmental bodies and of the major International Catholic inspired Organizations. The meeting succeeded at raising a number of positive considerations, conclusions, questions and ideas on which to build future collaboration. The catholic inspired NGO’s have been active in a vast panorama of activities and work fields which inevitably results in what may at first sight appear to be a heterogeneous group. Dialogue, coordination and exchange of information will always be essential in our work as organizations but the wide scope of issues covered by all of these organizations define the vast and challenging character of this ambitious process. The fact that all of these organizations share the same goals of defending human dignity and human rights and that they all agree on exploring paths to integrate as much as possible the social teachings of the Church in order to contribute to a more . just world is probably more relevant than the seeming heterogeneity of the group. I find here one more reason to say that this first gathering was an impressive achievementAll this means that a new process was given birth. It became rapidly obvious that the broader panorama of participants as well as the main objectives that had been defined for the new initiative, reached far beyond the historic mandate of the Conference of International Catholic Organizations which had been created some 80 years ago. The Forum indeed united many more actors (90) than the Conference (42) and the content of the debates of the Forum was more specifically focused on those elements that would enhance catholic presence and impact on the political scene. The relevance of the Conference, which had throughout its existence proved to be very supportive and constructive, had been repeatedly questioned over the past years and though major efforts had been made to give this platform new life and perspectives, a majority of member organizations were gradually convinced its very structure was no longer the most appropriate setting for future collaboration. The General Assembly in May 2007 subsequently ended a nearly three year process of evaluations and discussions with a clear two thirds majority to dissolve it. The dissolution of the Conference should therefore not be understood as a negative choice but rather as the outcome of a positive approach to the new challenges ahead of us. Nor is the Forum just another structure replacing a previous one. Even if there is a certain continuity between the Conference and the Forum because most of the member organizations of the Conference have already found their way into the Forum, the Forum doesn’t yet have legal identity, the number of participants has tripled in comparison with the Conference members and its scope of action is different. It would therefore be a mistake to compare the new Forum initiative with the previous Conference structure. Until today the initiative has been carried by a number of volunteers coming from the various types of organisational cultures who have been working with representatives of Holy See and it will take another Forum meeting before a clear structure can be envisaged. Focus has been on the building of this Forum as a dynamic process rather than as an institutional identity. Priority is today still given to the dynamics that should carry the work rather than to the structure of the Forum. It is believed that these dynamics will in time generate the appropriate structures. The recently enlarged working group will discuss future collaborative models to suit the objectives and enhance the networking of the catholic inspired organisations. There is today indeed a clear option for more flexible models rather than to return to the more traditional ways of bringing institutional actors together. We indeed need to develop ways that better respond to the globalizing world in which many more actors take part in the global policy debates with whom many of our organisations are already intensively interacting and for which it is necessary to develop broader consensus and stronger identity. All of our organizations have learned that such processes must be defined by specific goals and verifiable result indicators. The creation of the Forum is therefore not so much to be understood as a change in structure but rather as a renewal of dynamics and of a willingness to establish new roads to better networking amongst the organizations. The Forum is indeed a way to assemble organizations together, not a means to direct or govern them. Returning to the more traditional ways of more formally organizing the various catholic networks is today believed to be less productive. The lessons learned in structuring traditional ways of collaboration may no longer apply in a world which is actively networking at various levels. There is an urgent need to develop ways that better respond to an ever moving and globalizing world in which many more different partners are playing coordinating roles. Responsibility -for the standpoints taken, and accountability- to the catholic identity, are key words to be renewed. Catholic inspired organisations today already mingle with many non faith-based and other organisations even before reaching the intergovernmental debates. Indeed, building identity and perspective in these platforms is today probably as challenging as looking for impact on the international political agenda. There is here a clear call for broader consensus, better analysis and stronger identities which in turn demands the kind of structural flexibility the Forum hopes and intends to achieve. The change also invites the existing International Catholic Centres in Geneva, New York and Paris to host the organizations in their networking efforts. They are invited to play an important facilitating role in bringing these organizations together to discuss and reflect upon a number of themes that are on the political agenda. Themes will therefore not be owned by the centres but rather by the group of experts in the organizations who will together decide on the goals to be pursued in a common effort and in defining the appropriate work methodology. The International Catholic Centres which had been started many years ago in the immediate environment of the international institutions are the ‘natural place’ for the organizations to meet. The new dynamics are in turn an invitation for the centres to play a more important role as information spreader or even stronger as a voice booster for the catholic identity as experienced and lived through the thematic debates. The synergy between the various organisations and actors could therefore constitute part of the identity of the International Catholic Centres, which would then prove to be useful resources for the organizations. Today work has already started in the centre of Geneva where a number of organisations meets on three major themes: educatio, migration and human rights. The results of these efforts will likely feed the agenda of the next Forum meeting to be held probably at the end of 2009. We do not hesitate to acknowledge that there are elements of doubt and hesitation in this approach. The lack of a clear and transparent structure doesn’t facilitate its reading and understanding. The present working structure is furthermore considered to be too weak and too much based on voluntary participation to really achieve the major goals it was set up for. We fully agree on these impressions which we consider an additional challenge in building those structures that will serve the purpose for the coming decennia. The Forum is a place for exchanges but it is the task of the working group to develop a more defined working methodology – call it a communication strategy or an interactive network strategy – with and amongst the Forum participants to be submitted to the participants of next forum meeting of December 2009. A new structure or new dynamics do not mean that we have to start from scratch. The associations that have been invited to the Forum have a longer standing experience. Some of them obtained UN ECOSOC status more than fifty years ago and have been active in the various fields for many years. Many of these associations have already established a closer relationship with national and intergovernmental structures in the specific field of their action. Bringing these efforts together in dynamic perspectives will no doubt contribute to successfully pursue our goals as separate organizations and as Catholics. The challenges ahead are not the easiest and for reasons of clarity I would tend to divide them into the challenges from within and those imposed on us from without. The first group of challenges is related to our specific organisational cultures, which sometimes greatly differ and which have evolved over the many years of their existence into structures that are not immediately compatible. It is commonly understood that the potential of improved collaboration and networking is huge but this will demand work and time which today most of our organizations cannot easily provide. There is furthermore a need to reach a better reading and understanding of this potential to be translated in specific goals and for which working methodologies will need to be developed. There is a need to better understand the map of the various issues and challenges that invite us to develop positive answers and to define positions and strategies strengthening the catholic identity rather than enforcing competitive attitudes. A mapping exercise of the present goals and activities has been planned and should allow us to strategize and include as many organisations as possible in some of the identified goals. There is also a need to leave short term thinking and to plan for the longer term. This may seem very obvious but most of our organizations have learned or at times are forced to work with very short deadlines, and it must be said that the world around us, including the political world, is heavily marked by short term thinking. I would add to this non-exhaustive list the need to analyse our position as Catholics in the post modern world and to question the fundamental reasons for losing grip on the profound societal changes. This point already introduces the much longer list of challenges that stem from the rapidly changing world. Without even trying to be exhaustive a quick look around at the intergovernmental bodies shows how these bodies are themselves in a period of restructuring and self questioning. There is nothing wrong with that but the changing relations between intergovernmental bodies and national structures have an impact on the international decisions which are today increasingly based on national commitments or non commitments. This in turn demands differentiated advocacy efforts to be developed at both national and international level. That is where a well defined and quality relationship between the international advocacy and the national advocacy is of the essence. Institutional realities of intergovernmental organizations also differ from one another and require greater flexibility and diversity in our approach. There are the many political contradictions we face between what has been agreed upon in e.g. a UN sphere and what is then not or insufficiently ratified or implemented in the countries. There are questions on how to act when the world rather spends more money on consequences of conflicts, rather than spending less on preventing them… It is furthermore noticeable that many of the decisions affecting the lives of millions are taken in corporate multinationals which calls for a full new scope of relations to be developed. It is part of the responsibility of the catholic-inspired NGOs to contribute to a better and more just world and all have been engaged for many years in the various fields of action combating poverty, defending human dignity and the rights of the human person. Together we need to reach for further analysis and for improving strategies. The Forum may prove to be too large a place to analyse and conceptualize but it certainly is a place for organized exchange. To respond to the need for a deepened approach, I would suggest the creation of a think tank where the more fundamental movements and challenges can be given due time for analysis and strategic considerations which would then again be carried by the respective organizations in their own ways and patterns. This think tank is not yet given a clear format and is part of the future discussions. Civil society is clearly a strong carrier of ideas. Many of the civil society organisations are of Christian / catholic identity. It is therefore strategically understood that their role in society as carriers of a moral message is not to be underestimated. Subjects today cannot be tackled by one person or one organization only. The multi-dimensional aspect of some of the societal challenges clearly calls for better coordination and new adapted strategies and methodologies. The organisations have heard this appeal and the way forward is being defined.